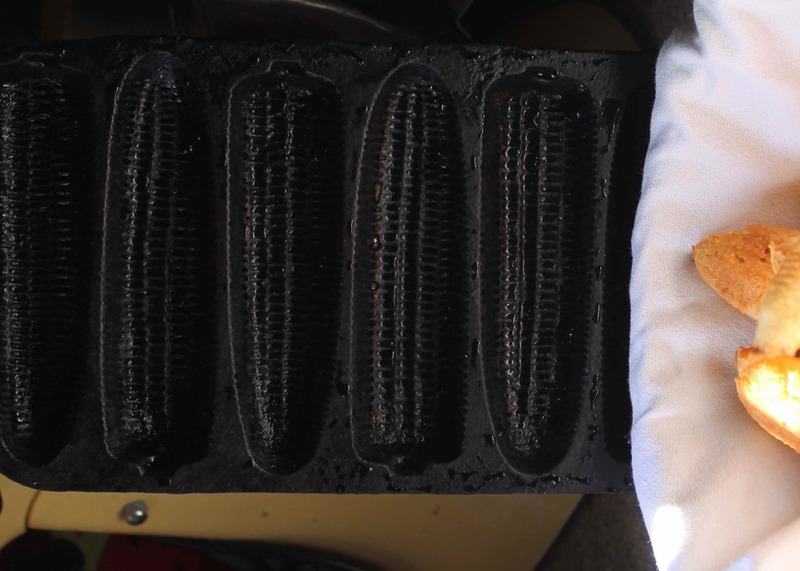 I’m giving one of my cast iron cornbread stick pans to Michelle and I just had to check that it was working properly. I can cheerfully report that it does. It really does! I inherited this one from my dad’s parents and it is perfectly seasoned after years and years cornbread making. 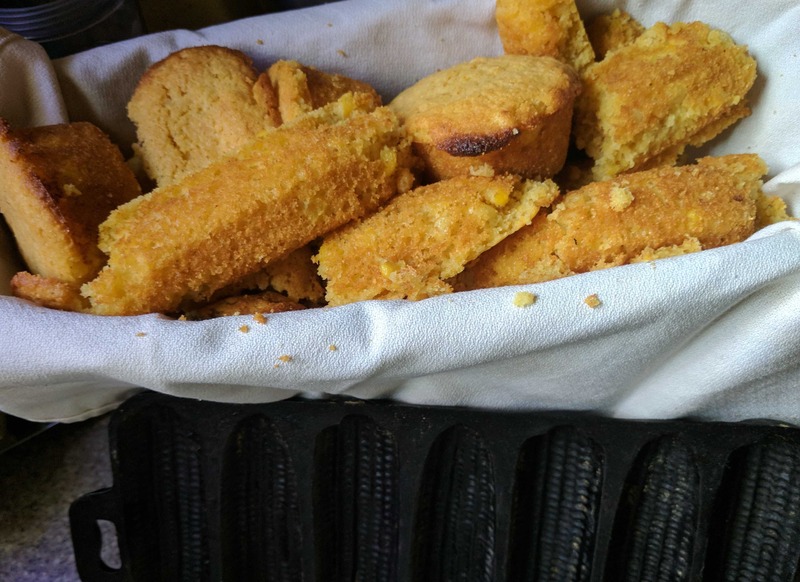 I like cornbread sticks as they increase the ratio of crunchy to the rest of the bread. Trust me, it makes scientifically better cornbread! If all you have is fine or medium ground corn meal, use just the one cup. But I like the texture from the crunch of coarse or stoneground corn meal so I add that. I do soften it in milk, as I don’t fancy chipping a tooth! Soften some butter as the cornbread cooks, to make slathering it on super easy. Place the coarse ground corn meal in the milk and stir to combine. Let sit for 30 minutes to soften and absorb the liquid. After 30 minutes, pinch off pieces of the shortening and place dollops in each slot on the cast iron cornbread stick pans. Preheat oven to 425 degrees F with the pans in the oven, melting the shortening. Mix all other ingredients in a large bowl. Pour in the melted shortening until it is the consistency of thick pancake batter. Pour the mixture into each of the corn sticks in the pans and bake for 20 minutes, rotating the pans midway through cooking. Tops will be golden brown. Immediately remove from pans to cool. Serve with lots of butter or crumble some in a glass with a drizzle honey and plenty of cold milk. As much as it might surprise regular readers of my food blog, I don’t always have cream in the house. I do have whole milk, though, so I was able to do a cheat on one of my corn recipes. Using corn that Michelle cut off the cob and frozen in pint bags, I made some delicious creamed corn. It was thick and rich and no one missed the cream. 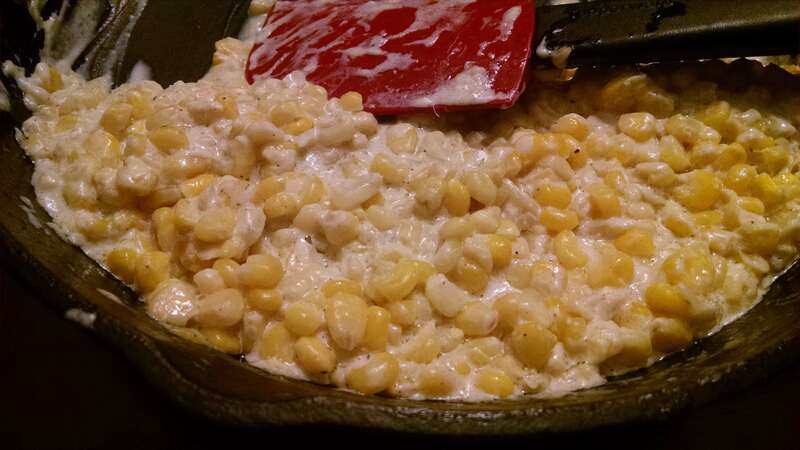 In a medium skillet, combine corn, butter and 1/2 cup milk. Place over medium heat. Add the flour to the remaining 1/2 milk and whisk to combine. Pour flour mixture into the corn and stir well. Add in the salt and pepper and bring to a simmer, stirring regularly, making sure to scrape the bottom so the milk doesn’t burn. After about 10 minutes, the mixture will have thickened. Taste for seasonings and serve. 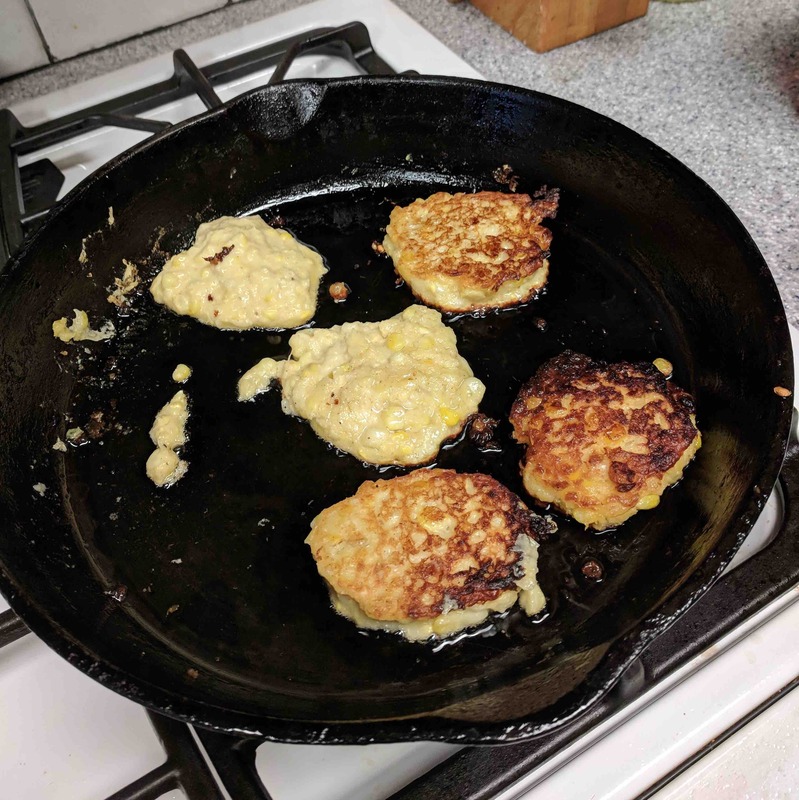 We had a shrimp boil last night and, since corn goes well with shrimp, we decided to make corn fritters to go with the sea’s bounty. 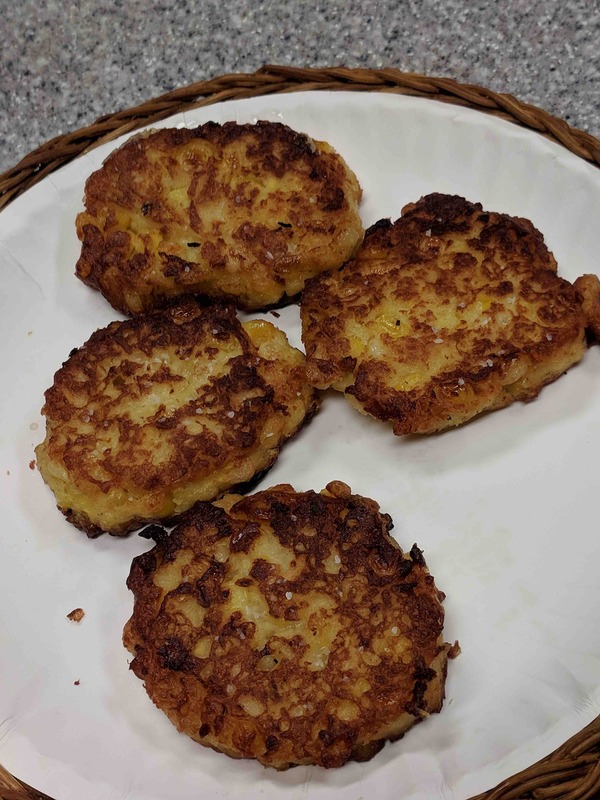 What resulted was closer to corn latkes or savory corn pancakes but they were super corny and delicious. If you don’t have fresh corn, use frozen kernels. ½ cup vegetable oil, or more as needed. Using a sharp knife, cut ears of corn lengthwise through the kernels to remove them from the cob. Using the back of a knife, scrape any pulp and corn milk from cobs into the bowl. Divide corn in half and run one of the halves through the blender to puree. Mix all the corn back together in a medium bowl. Stir in cornmeal, egg, flour, milk, onion, salt and cayenne pepper. Mix well. In a large, heavy-bottomed skillet, heat oil over medium-high heat until shimmering. Drop 6 tablespoons of batter into hot oil. Fry until golden brown, about 1 minute per side. Using a slotted spoon, transfer fritters to a plate lined with paper towels. If necessary, add more oil to skillet and heat until shimmering then fry remaining batter. Serve fritters immediately. I wanted something different for breakfast and I had been thinking about corn muffins recently. I decided to make a mash up that would have a hit of protein but still have corn flavor. These ended up tasting a little like cornbread stuffing (not a bad thing at all). They also freeze really well and can be rewarmed in a microwave. Brown sausage over medium heat. Add celery, onion and bell pepper and sauté until softened. Remove skillet from heat. Stir in sage. In a large mixing bowl, whisk together corn meal, all purpose flour, baking powder and salt. In a separate bowl, whisk together milk, chicken broth, sour cream, eggs and corn kernels. Add to the corn meal mix and stir to combine. Fold in meat mixture. 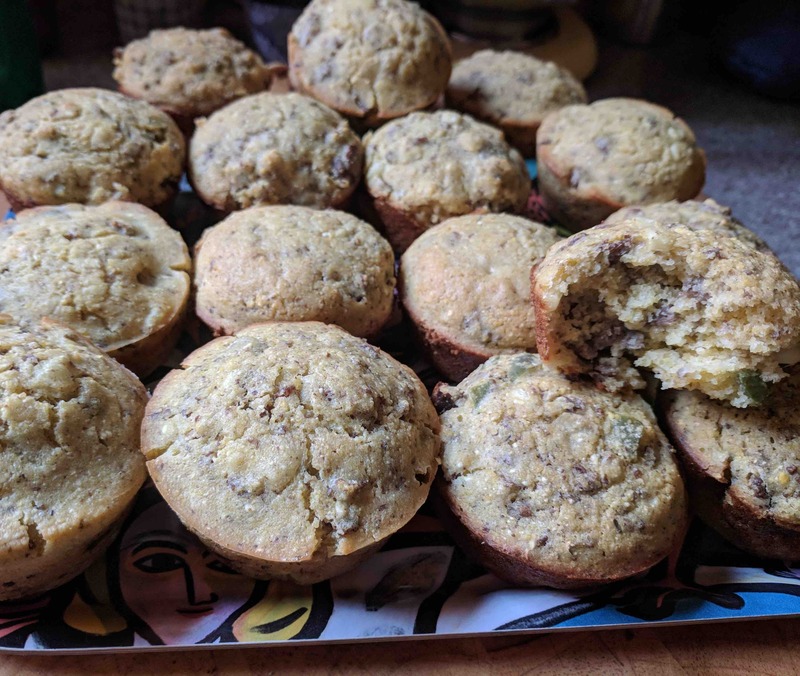 Using a ¼ cup measure, fill buttered muffin tins with the mix. 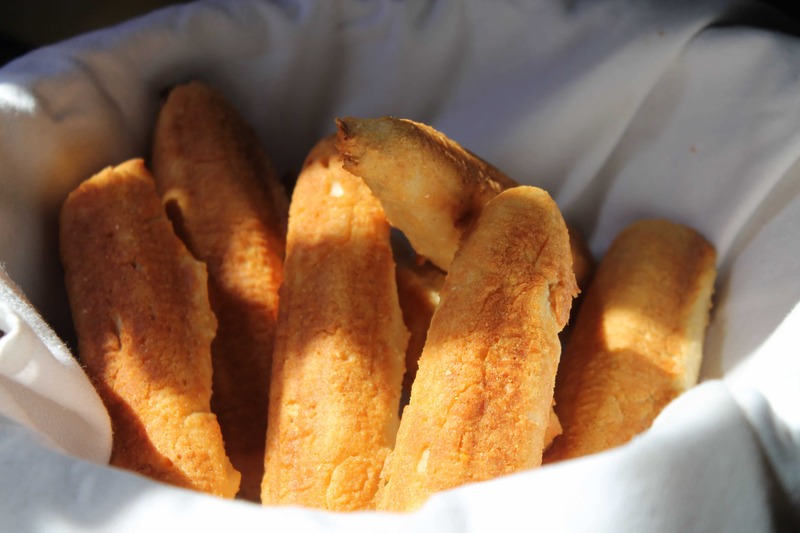 Bake in preheated oven for 20-25 minutes or until a toothpick inserted in the center comes out clean. I’m a sucker for corn puddings and corn casseroles. I’m even known to use the recipe from the box of Jiffy Corn Muffin mix (recipe found here) or even the cheesy goodness of Paula Deen’s version. 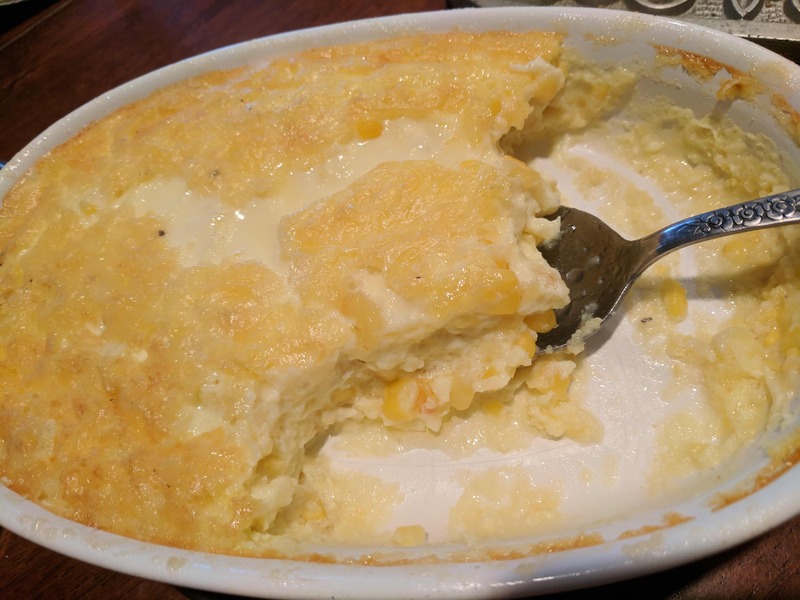 Since those can be a little sweet, I was pleased to watch P. Allen Smith introduce his Aunt Antha’s Sweet Corn Pudding on his show (here is the video). I cut his version down, as I rarely entertain eight people at one time these days. Put about half the corn in a blender or food processor until finely chopped. Stir eggs and milk into a bowl. Add the corn and all its liquid. Stir to combine. Add in the cornstarch, salt, pepper and melted butter. Stir well. Pour into a well buttered baking dish and bake until the center jiggles slightly when shaken and top has begun to turn brown. This takes 30 to 40 minutes. Serve hot. I’ve been craving corn muffins ever since I saw a TV chef make some. Today, I made a batch and then proceeded to gobble half of them up, still steaming from the oven. I put in some corn that came from Michelle’s grandfather and which she had cut off the cob and put in the freezer. 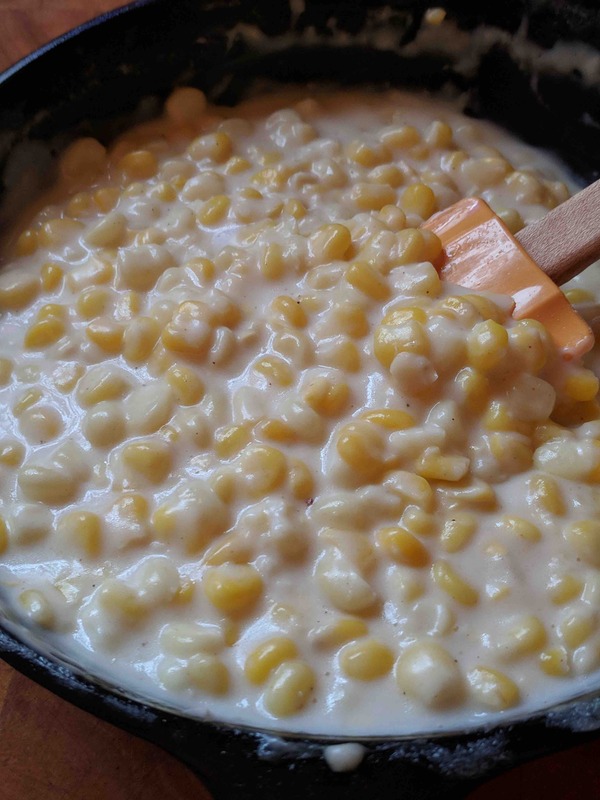 This is a southern recipe, so there isn’t a lot of sugar in it but, the addition of fresh corn (you can use canned or frozen, too), means they’re plenty sweet anyway. Whisk together dry ingredients, making sure there are no white streaks. Scramble the eggs into the milk (or buttermilk). Use melted butter to grease either a 12 cup muffin tin or, if using cast iron corn stick pan, grease that plus a 6 cup muffin tin. Add remaining melted butter to milk and eggs. Stir in fresh corn and then add to the dry ingredients. Pour the batter into the prepared pans and bake for 15 to 20 minutes. A decadently rich accompaniment to most any meal is creamed corn. This version is very simple but very, very good. Cut the kernels from the corn, making sure to milk the cob by running the back of the blade down each cob to get all the yummy juice. Heat the butter in a medium cast iron skillet over medium heat. Add in the onion and sauté until translucent, about 3 to 5 minutes. Add in the corn and cook through, about 5 minutes. Pour in the sour cream and stir well. Add in the salt and pepper. Reduce heat to low and simmer for 5 minutes. Taste for seasonings and serve.